The edible leaf or paddle of the prickly pear cactus and other varieties of cactus. It is prepared by removing the thorns and eyes, after which it is served fresh, canned, cooked, steamed, or pickled. The meat of the pad can have a somewhat sour green bean flavor or a delicate, almost asparagus or bell pepper taste, depending on how it was prepared and the variety of cactus. It can be served as a vegetable dish or as a complement to other foods such as soups, salads, and egg dishes. When cooked, the pad emits a substance that is sticky, similar to cooking okra. 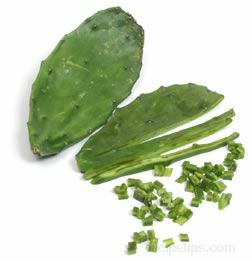 It is also referred to as nopales.